On Saturday, March 11 2017, I suffered the indignity of barracking for the Adelaide Crows. Lest that sound harsh, it brought to an end an oath taken a full twenty years earlier to never respect this foe. The preliminary final of September 1997 needs no explanation for Bulldog fanatics. At the time I was 11 years old – young perhaps, but old enough to have endured over a decade of trademark Bulldog hardship. 22 points up at three-quarter time, we were defeated by a mere 2. The sight of my fallen hero, Chris Grant, lifeless on the turf after the siren confirmed what I had always suspected: that I bled red, white and blue. The older members of our family wiped away tears as we left the ground, before a group of jubilant boys in Adelaide guernseys stopped me in my tracks. One produced a Chris Grant poster that had been a centerfold in the Herald Sun. He held it up in front of my face before slowly ripping it in two. He threw the poster to the ground and stomped on it before the boys burst into laughter and ran away. Needless to say, I have hated the Crows ever since. But there is something special about the AFLW Crows. They have forged a unique identity that has made even my most reviled of foes loveable again. Last night, they played in their own preliminary final of sorts. One game clear of the Dees, they needed only a win to secure a spot in the inaugural AFLW grand final. The stage was set at their home-away-from-home, TIO stadium, a fitting nod to the nine women from the Northern Territory playing in the Crows’ team. With half their side based in the NT, team meetings are conducted via Skype. 28-year-old Talia Radan (nicknamed ‘the Cougar’) says the team “wave at each other constantly and argue about who is hanging up first”. This game is played to the scene of an ever-deeper purple sky as thunderstorms approach and lightning cracks threateningly in the distance. The freak prospect of two AFLW games being suspended for lightning lingers. Adelaide’s first goal comes after a deft tap from Perkins in the ruck falls to Tayla Thorn, who kicks truly to Sally Riley on the lead. For perhaps the first time this season it is not cult hero Perkins who receives the loudest cheer, but Thorn, an 18-year-old Indigenous NT local. Unbelievably, Thorn has no less than 17 biological sisters, and considers herself a ‘sister’ to many more. Thorn is a graduate of the Woomeras, a national squad for Indigenous players seeking entry into the AFLW league. Thorn has spoken openly of her desire to be a role-model for Indigenous girls, labelling her own journey through the program an inspiration: “I still call those girls sisters to this day,” she said in New Daily. Late in the first-quarter the Crows strike again, this time set up with a 1-2 from Heather Anderson and a screamer by captain courageous Erin Phillips. Anderson is less visible than usual, her trademark hot pink helmet replaced by a camouflage one. Anderson is no-fuss on field, a demeanor that belies her character. Suffering multiple concussions as a kid, Anderson began wearing the helmet as a protective mechanism. But after her mother Sandra’s vision degenerated, she began sporting the pink helmet to help her Mum spot her. “[It] started as a joke on my behalf… because I was a tomboy and hated wearing pink. But when I wore it for the first time Mum loved it so I kept on wearing it and she kept coming to my games,” she told The Herald Sun. This time, Anderson, who is a full-time medic for the Australian Defence Force, wore camo to raise money and awareness for ‘Soldier On’ – a initiative providing support to the many soldiers experiencing mental health issues after service. A 13-0 quarter from Adelaide threatens to end Melbourne’s grand final hopes, but competitive beasts Karen Paxman (21 disposals), Daisy Pearce (20) and Elise O’Dea (16) haul their team back into contention. O’Dea in particular inspires, running back with the flight of the ball as Phillips again threatens to take a contested grab up forward in the shadows of half time. Eyes only for the footy, O’Dea manages a spoil while spectacularly flying over her teammate and landing head-first into the turf. Guest commentator and Fremantle AFLW coach Michelle Cowan lauds her as “tough as nails, one of the toughest in the competition”. The momentum has turned, and Cowan accuses the Crows of “walking” to the contest. “Said like a true coach,” laugh her fellow commentators. At three-quarter time, her team trailing by 8 points, Crows coach Bec Goddard echoes Cowan: “they’re just sitting back and watching,” she tells Channel 7. Shaking her head, she concedes that she alone can do little to turn the tide: “they need to work it out themselves”. This is ‘bad cop’ Goddard, or perhaps just an experienced Cop talking. Goddard works full-time for the Police Force, currently as Sergeant of the Joint Anti Child Exploitation team run by South Australian and Federal Police. She says her job keeps football in perspective – especially after events like the 2004 tsunami disaster in Thailand where she “worked at the outdoor morgue”. You get the sense that she is no-nonsense, but loved by her players nonetheless. You see it in the proud, beaming faces of her troops as she belts out the song post-game with the ‘girls’. Tonight, she is somber, a guaranteed grand final place slipping out of Adelaide’s grasp. A brilliant sidestep and goal from Melbourne’s Aliesha Newman with 4 minutes to go appears to put the game beyond doubt. The Dees go up by 14 points. After a quick goal to Crows’ marquee player Kellie Gibson, the commentary box note that the Crows “need something special from here”. Enter Sarah Perkins, surely the most feel-good story of them all. Overlooked by every single Victorian team despite being selected in the 2016 VFL Women’s team of the year (after a 52-goal return for the Eastern Devils) Perkins has made a mockery of them all. With a minute on the clock Perkins crumbs the ball off a pack at 40 and brilliantly snaps a goal. Wide-eyed and stony-faced, she demands one more lift from her team. I sense a 1997-style boil over. But 20 years on, it isn’t to be. The Dees force multiple ball-ups, using the lack of time-on in AFLW to their full advantage. 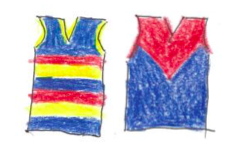 The Crows go down by a familiar margin of 2 points, only this time they have one more week – and my heart. I came to this report not knowing the result, it kept on the edge of my seat to the end. Thanks Kate. And may I apologise on behalf of all decent Crows supporters. That unpleasantness after the ’97 Prelim (at which time I was also in the NT, incidentally) was extremely graceless in any case; to perpetrate it on an 11 year old girl is appalling. Great write up, Kate. So disappointed with last night’s performance, the margin flattered. Crows are so good at making a contest which is the minimum you ask from a team. But to see them repeatedly let themselves down by foot; kicking the ball blindly forward to a Melbourne structure set up precisely for that while the Dees put the ball into the hands of a smaller number of players that hit the next teammate in the line of the chest was so frustrating. Need to change that up this week – can’t let Collingwood do the same thing and expect to win. But, oh, they have heart. I especially liked the personal background info on various individuals. One of the real joys of this first AFLW season has been finding out the interesting and diverse personal stories of so many involved. The Crows have set themselves a task next week. The Pies look to be running into form late. Aw thanks John! I’m a bit worried about them next week but fingers crossed they’ve got too much to play for to let it slip! Fab insight into the Adelaide team – so many wonderful back stories! Hi Kate, thanks for the article and the links. Wonderful report as usual. Next week will have more wonderful and heartbreaking stories. And then the GF and back to regular seasons games. Women’s footy is forever transformed. And us along with it.